An excellent choice for when you have 4 mobile vocalists and want clear, accurate audio. 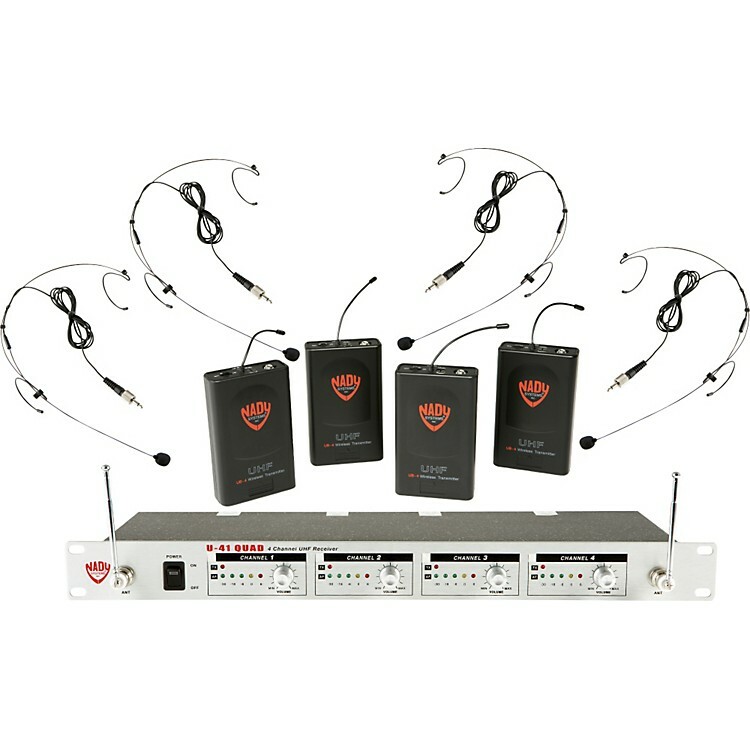 This Nady U-41 QUAD wireless system features a professional 4-channel UHF wireless system which offers clear, natural sounding wireless and comes with 4 UB-4 bodypack transmitters with 4 black HM-10 headset microphones. The Nady HM-10 ultra small condenser headset microphone is optimally designed for singing and speech applications. The HM-10's small size and light weight make it ideal for all handsfree use with minimum visibility. Perfect for singers/musicians (drummers, keyboardists), vocal/dance performers, DJs, television announcers, public speakers, and aerobics instructors. The Nady microphones have a 3.5mm phone plug that securely locks into the UB-4 bodypack transmitters. Enjoy hands-free, wireless freedom with this U-41 QUAD wireless mic system. Order today!